Jupiter Red Spot - Juno Spacecraft launched on 5 August 2011 from Cape Canaveral. Atlas V-551 rocket carried Juno spacecraft. Juno spacecraft reached Jupiter on July 2016. Juno will orbit Jupiter 32 times in all. Juno has scientific instruments to study Jupiter’s atmosphere. On Monday July 10 Juno spacecraft sent raw images of Jupiter’s red spot to NASA. What Is Jupiter’s Red Spot? Jupiter Red Spot was discovered in the 17th century. Jupiter’s great Jupiter red spot is 1.3 times as wide as earth. The great Red spot is a high pressure storm on Jupiter. The great Jupiter red spot existed for more than 350 years ago. Recently, the great red spot has appeared to be diminishing.Different colors in clouds are found to swirl around the red spot at varying altitudes. Winds are present in the red spot reaching speeds of about 270 miles per hour. Great Red Spot produces two kinds of turbulent energy waves that collide and heat the upper atmosphere. Juno spacecraft is a NASA’s earlier pioneer space craft. Juno spacecraft is to probe the Jupiter planet. Juno is called an orbiter. Spacecraft did not land. Juno was orbiting for one year around north and south poles of Jupiter. Juno takes 14 days for one trip around Jupiter. Juno was launched in 2011; it reached Jupiter in 2016. On 4 July 2016 Juno began its trip around Jupiter. Juno sent color images on10 July, 2016; it was a Juno’s first orbit of Jupiter. The color image shows atmosphere of Jupiter including red spot and Jupiter’s largest four moons. 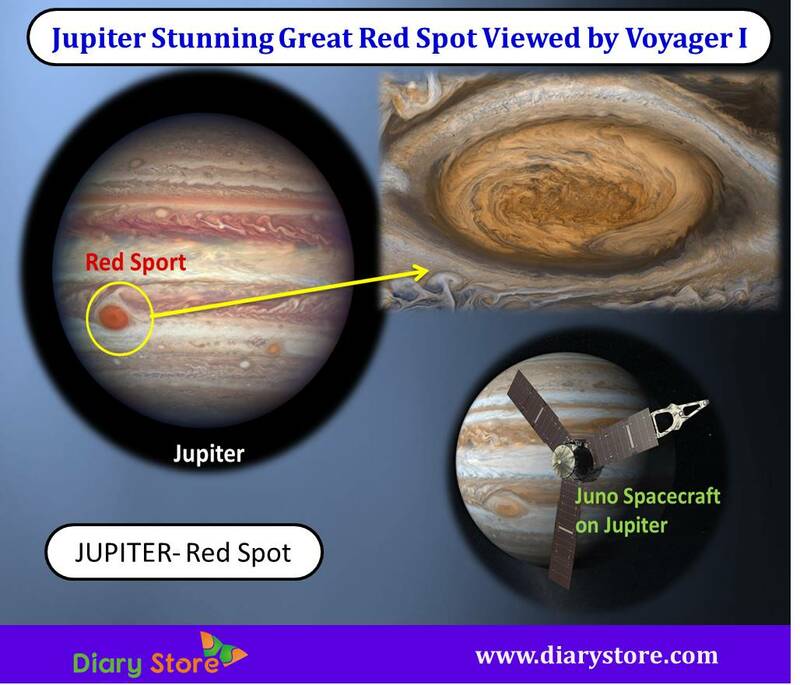 On July 10 Juno performed its seventh flyby Jupiter at a time Juno took the red spot image. Juno’s next close flyby Jupiter will occur on September 1st. How Do The Juno Instruments Works On Jupiter (Jupiter Red Spot)? Gravity Science instrument is used to study the interior structure of Jupiter. Juno space craft makes detailed measurements of the Jupiter’s gravitational field. Juno uses two fluxgate magnetometers to measure the strength and direction of magnetic field and gives detailed pictures around Jupiter. Magnetometer was designed by the NASA's Goddard Space Flight Center Greenbelt, Md. 1. What Is Mas Spec Pen? Microwave radiometer is to study the hidden structure under Jupiter’s cloud tops. Microwave radiometer determines the abundance of ammonia and water in the Jupiter atmosphere. Microwave Radiometer was built by the NASA's Jet Propulsion Laboratory in Pasadena, Calif.
Jupiter Energetic particle Detector instrument measure the spectra, energy, mass species and angular distribution of the high energy charged particles. This instrument consists of three sensors, each sensor bearing six ions and six electrons. JEDI works with Jupiter Auroral Distribution experiment and waves instruments to investigate Jupiter’s polar space environment. Jupiter Energetic Particle Detector Instrument was designed by the Johns Hopkins University's Applied Physics Laboratory, Laurel, Md. Jovian Auroral Distribution Experiment works in coordination with the Jupiter Energetic particle Detector instrument and wave’s instrument. These instruments study the processes and particles forming Jupiter’s powerful auroras. The Jovian Auroral Distributions Experiment was built by the Southwest Research Institute in San Antonio. Plasma Wave Sensor was designed by the University of Iowa in Iowa City. Wave’s instrument measures plasma and radio waves in the Jupiter’s magnetosphere. This instrument helps to understand interactions between Jupiter’s magnetosphere, atmosphere and the magnetic field. The Ultraviolet Imaging Spectrograph instrument was designed by Southwest Research Institute in San Antonio. Ultraviolent imaging spectrograph takes pictures of Jupiter’s aurora. This instrument works in tandem with Jovian Auroral Distributions Experiment and Jupiter Energetic Particle Detector Instrument, which measures the particles that create the auroras. Ultraviolent imaging spectrograph helps to understand the relationship between the streaming particles, the magnetosphere and the auroras. Jovian Infrared Auroral Mapper was built and designed by Italian National Institute, Italy. Jovian Infrared Auroral Mapper is designed to study Jupiter’s atmosphere in and around the auroras and help understand the relationship between the magnetic field, auroras and the magnetosphere. Jovian Infrared Auroral Mapper consists of a camera and a spectrometer. Camera takes pictures in infra-red light, heat radiation with different wavelengths. Spectrometer splits light into its component wavelengths. JunoCam takes color pictures of Jupiter’s cloud tops in visible light. JunoCam provides wide-angle view of Jupiter’s poles and atmosphere. JunoCam takes pictures when Juno is close to Jupiter. Wide-angle camera will provide new views of Jupiter’s atmosphere.